Another week has passed, and gamescom 2018 is in the books- and what a gamescom it has been! 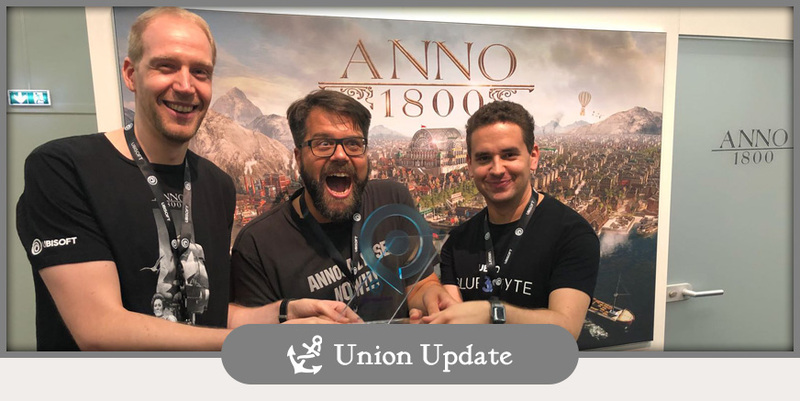 After countless presentations, interviews and stage shows – not to mention an award (Best PC Game of gc 2018) that we are as you can see very proud of – the Ubisoft Blue Byte team has mostly unscathed returned to the studio to tackle the final 6 months of development before Anno 1800 ships globally on February 26th, 2019. However, we do need a little bit more time to rest our vocal chords and to read your hundreds of comments on the Union, our forums and social media, so there won’t be any new Union content this week. 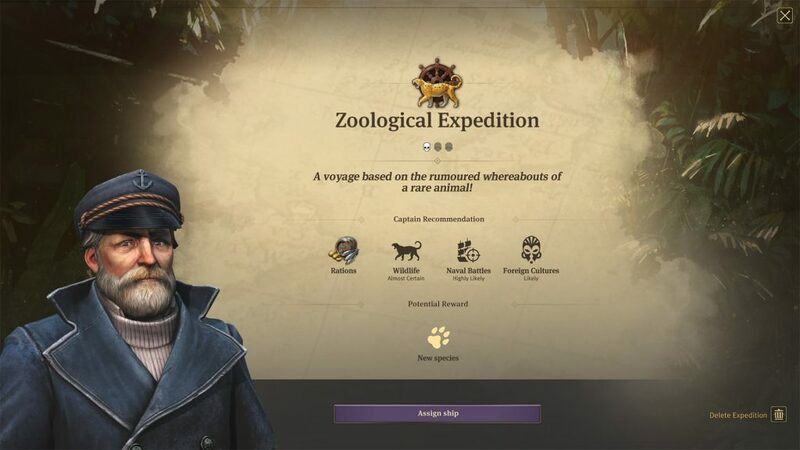 Starting next week, we will return to our regularly scheduled programming as we start to review gamescom with you, and take a closer look at some of our newly announced features like South America and the expeditions. In the meantime, feel free to share some of the questions you would like us to tackle over the next few weeks in the comments! 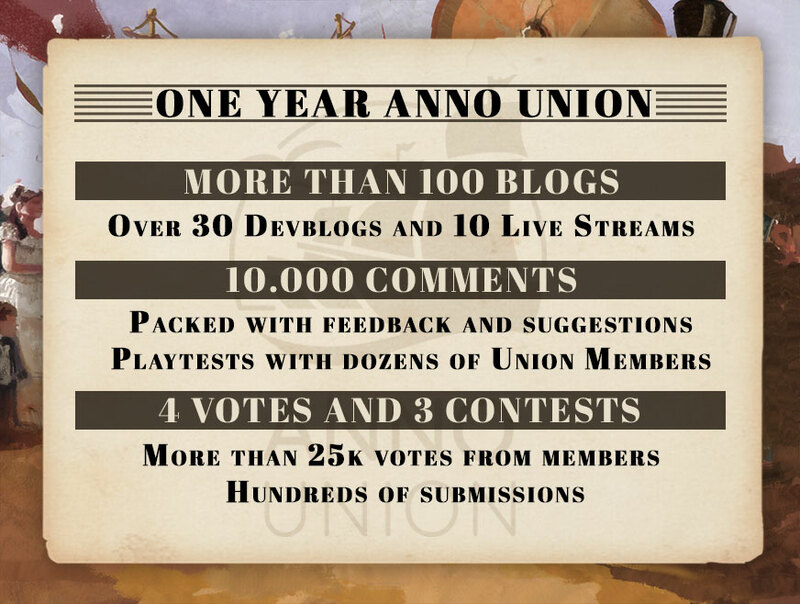 UnionUpdate: One year Anno Union! It was a hot late summer when we announced the Anno Union at gamescom 2017 in Cologne. Since then, a project born out of passion from our team slowly developed into the community program we know today. The last 12 month has been an exciting ride, we published over 100 blogs, including over 70k words and hundreds of screenshots of a game which was over a year away from release when we started. 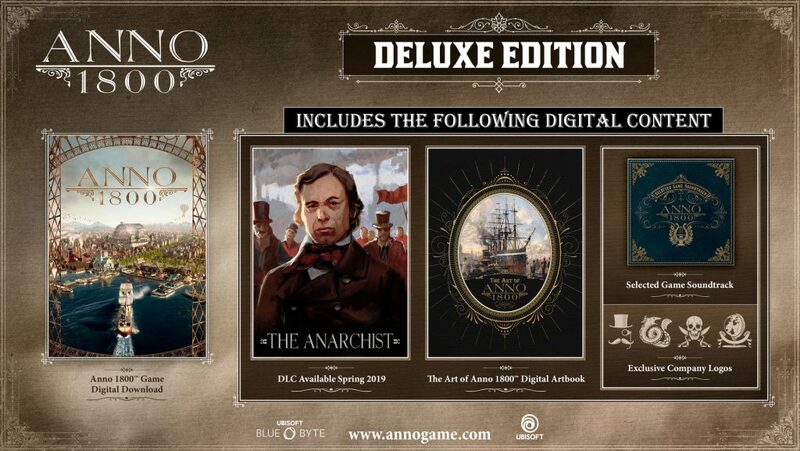 With over 10k comments full of valuable feedback, hundreds of amazingly creatively entries and striving fan projects we think it was worth the effort, and the Anno Union is here to stay. We want to say thank all of you for your passion in sharing countless thoughts, ideas and. Your voice had and will continue to have an impact on many features of the game. 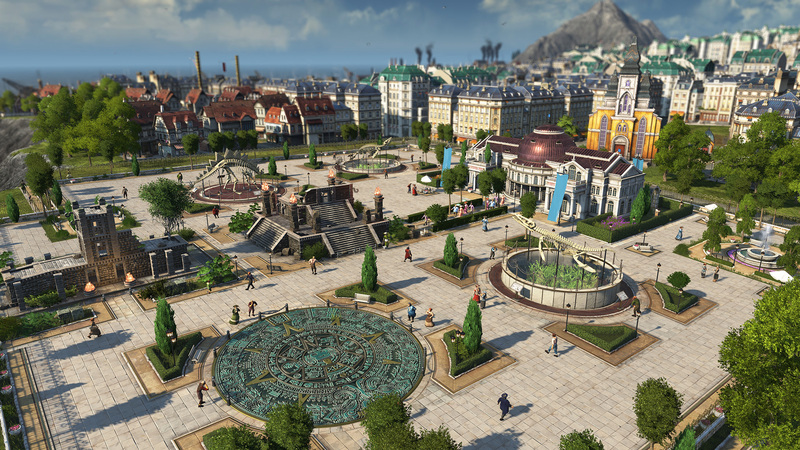 The combination of feedback comments, discussions, votes and focus tests has proven incredibly helpful for the development of Anno 1800. With the release of the game in February 26th 2019, there are still many topics on our checklist and we will not only continue to bring you devblogs, votes and live streams; we will further invite more and more Annoholics to our focus test groups in the weeks and months ahead. The one-year anniversary of the Union was also the perfect moment for us to launch the new version of our Anno Union website, including many improvements in visuals and usability. Expect new content on the website to show up in the near future, as we will provide you with fan assets such as wallpapers and will also give fans and fan creations a proper spotlight. But more about that in Union Updates to come! 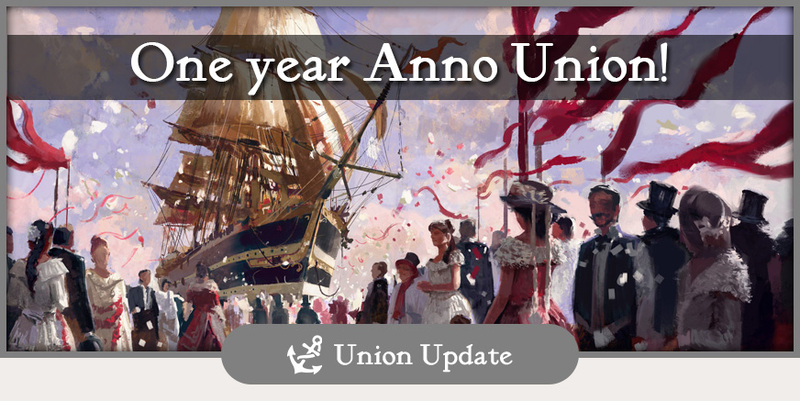 What is your verdict for Anno Union year one? We put a lot of work and love into the project, which will accompany Anno 1800 up to the launch and beyond. It has been a crazy few weeks but we are ready to roll. Before we leave to our road to gamescom 2018 adventure, we had the spontaneous idea to hop in front of the camera for a final message from the team. 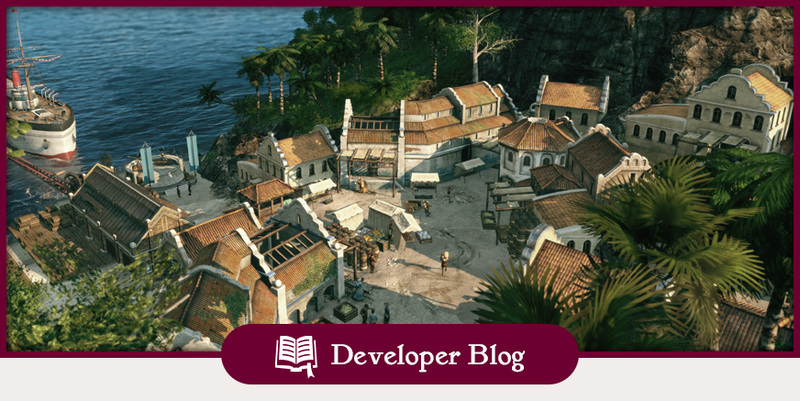 To create an atmosphere of a lively metropolis in Anno 1800, we not only makes use of an high amount of detailed visual feedback, audio design plays also an important role to breathe life into the world of the 19th century. Today, we invite you into our audio studio, where we show you how our audio team creates dynamic sound landscapes with an ear for detail and of modern technology. We strongly recommend grabbing your headphones for this week’s Devblov, as this one is for all audiophile Annoholic’s out there. 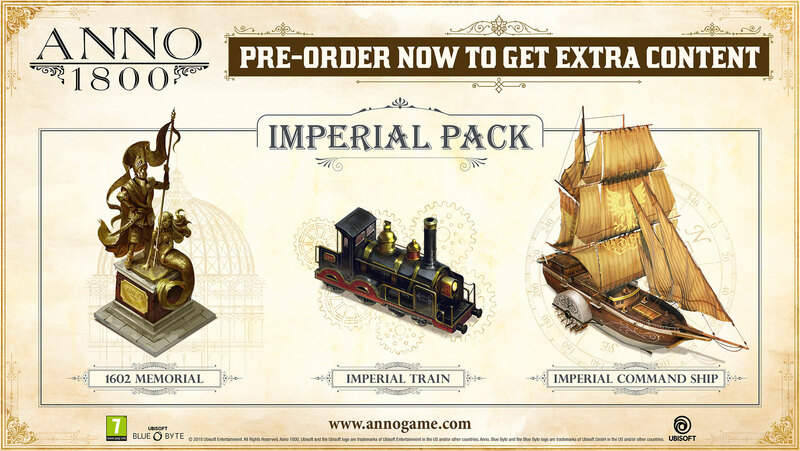 It’s 7 days until gamescom and today to clearly time to share some more detailed information about Anno 1800’s presence. Nevertheless, we should not forget the teaser for this week’s DevBlog, where we will give you exciting insights in our sound design and how we create believable and atmospheric sounds to carry you away in the world of the 19th century. As briefly mentioned last week, the game will be playable at our Anno 1800 booth in the Ubisoft area in Hall 6. Your chance to experience the seventh title in the Anno series hands on and we are thirsty for feedback about our gamescom demo. We have also quite a few things to reveal and to announce in Cologne but rest assured that for everyone who is not able to visit us, we share all the important news the Union. And if playing Anno 1800 is not enough, there is even more during this truly Anno packed gamescom 2018. We will present the game two times a day on the big Ubisoft stage, showing you Anno in all its brimming details and give a glimpse on new features. Furthermore, we bring back our UbiLounge presentations again where we not only demonstrate the game live but also answer your questions. We know that you are also curious about goodies but we also love surprises. What we can tell that we there will be free Anno 1800 goodies at the convention for the ones playing the game and visiting our presentations. Try to get your hands on one of them as all items are as long as stock lasts. 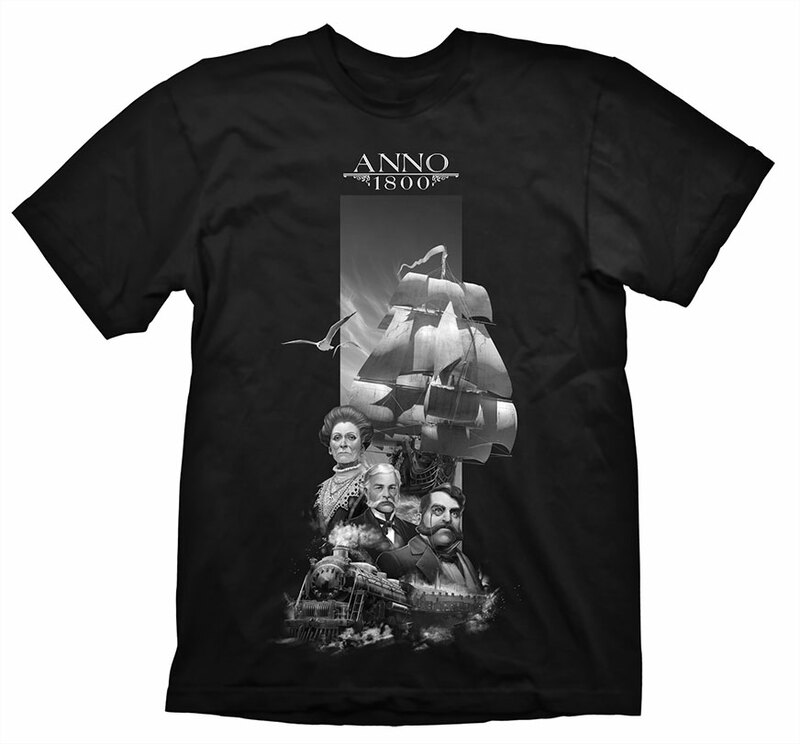 During our live streams, many of you mentioned that you really like our Anno 1800 developer shirts, showing iconic characters of the game. We managed to produce a limited quantity of that premium shirt (without the dev tag) for gamescom and you will be able to buy it at the Ubisoft merchandise booth in Hall 5.2. And if you managed to your hands on one of our goodies or the Anno 1800 shirt, feel free to share your loot with us on our social media channels. Speaking of which, our Facebook and especially twitter channel will be the easiest way to get gamescom live coverage. While we will publish several blogs next week with the information about all the announcements, we will provide daily snapshots, news and clips from the convention. 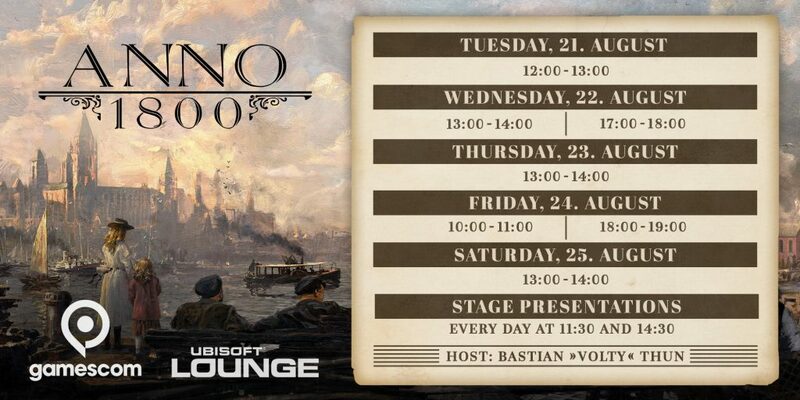 After gamescom, we will follow up with Union blogs and a stream covering our Anno 1800 gamescom experience. On gamescom Thursday, we will also have our Anno Union community dinner. Invitations have been sent out and we got a confirmation from all participants. We know that many of you were eagier to join us for that event and if you were not able to grab a slot, we would love to say at least hello to you during our Anno presentations in the Ubisoft lounge. Time is flying and it is only two weeks until gamescom will open its doors for hundreds of thousands gaming enthusiasts. An event with quite some significance for Anno 1800 and today, we want to share quite some exciting news about our presence at gamescom 2018! 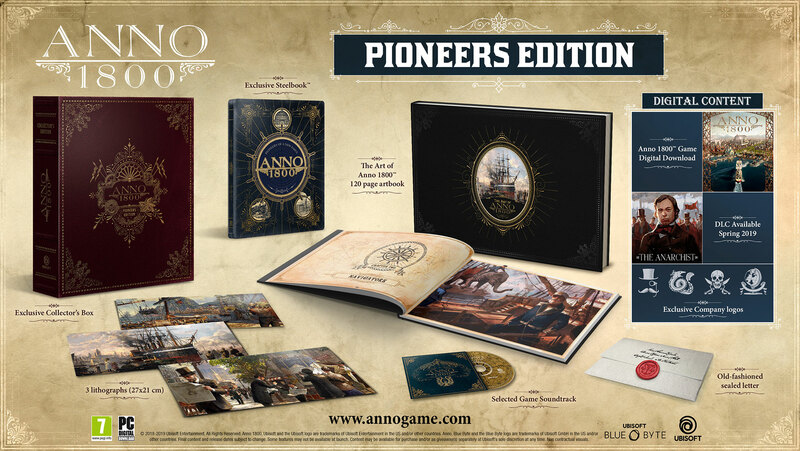 This year’s convention will be truly special as Annholic’s will be able to play the seventh title of the 20-year-old strategy series at our Anno 1800 booth. And if playing the game is not enough, we will also return with our Union UbiLounge presentations, where we will give you an exclusive look on the game and also answer questions from our communities. 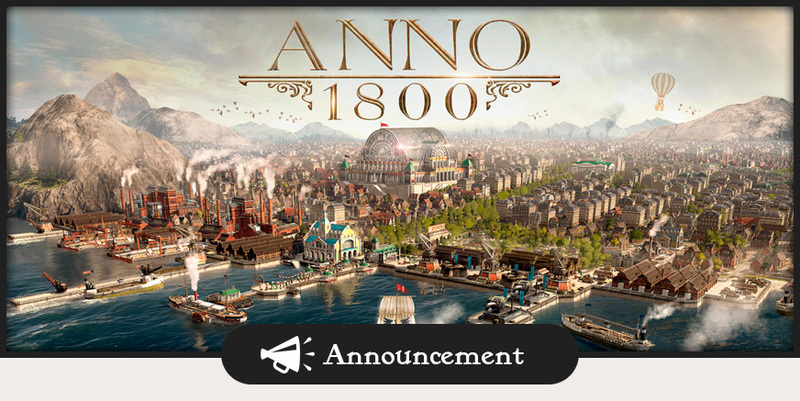 But it’s not just playing the game, we will also lift the curtain on never seen before features, which you can not only try out for yourselves but also watch during our daily Anno 1800 stage presentations. For anyone who is not able to visit us in Cologne, do not worry: we will share an overview with all the big announcements in a blog update in the Anno Union followed by detailed DevBlog coverage coming after gamescom. Our Anno Union community initiative saw the light of day during our big reveal at gamescom 2017 and what better way of celebrating than with our gamescom community dinner? We will send out the invitations via e-mail this week, which will also include all necessary details for the event. Please keep in mind that seats are limited, so only people who get an invitation via mail this week are eligible to participate. On another note, the submission period for our Union Ship Design Contest is officially over. Again, the amount of creativity and great design ideas coming from our Annoholics managed to impress the team. 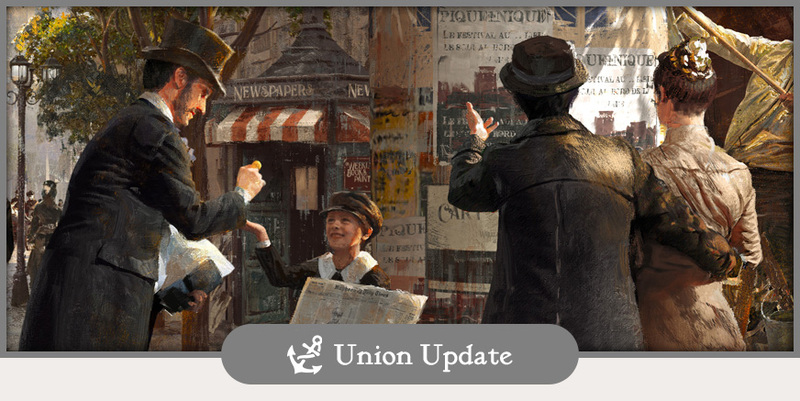 It will take some time to go through all the submissions and we will keep you in the loop in a future Union Update. As we are currently busy with the final preparations for gamescom, we put this week’s DevBlog on hold. 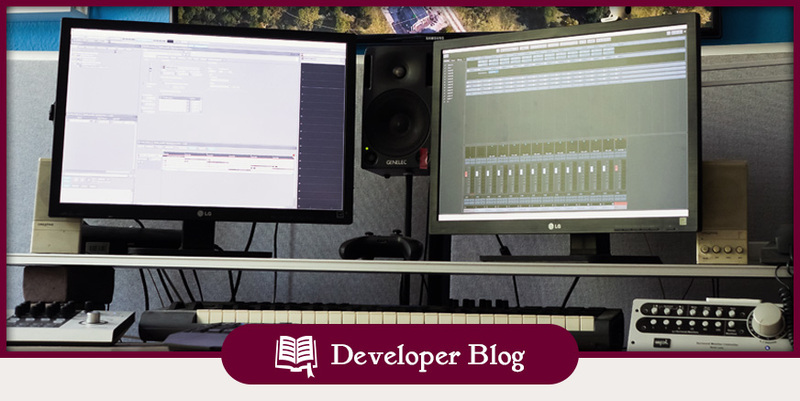 Instead, we will have a very special blog next week where we give you a very detailed look behind the scene of Anno 1800’s audio design. 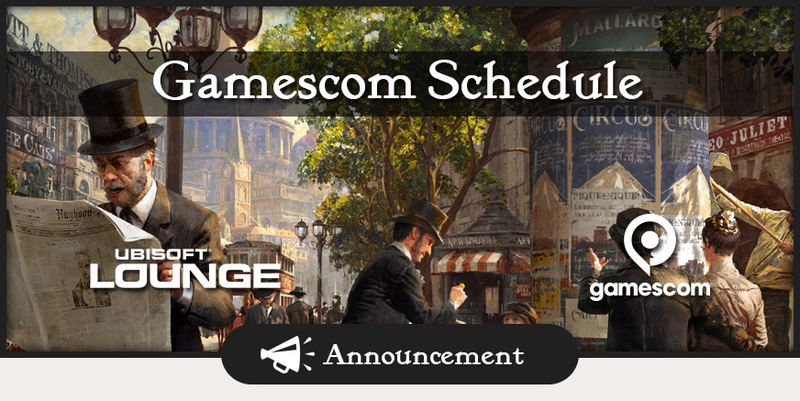 We will also share the exact schedule for our UbiLounge and stage presentations at gamescom 2018 in the upcoming week. We are looking forward to see you at gamescom! 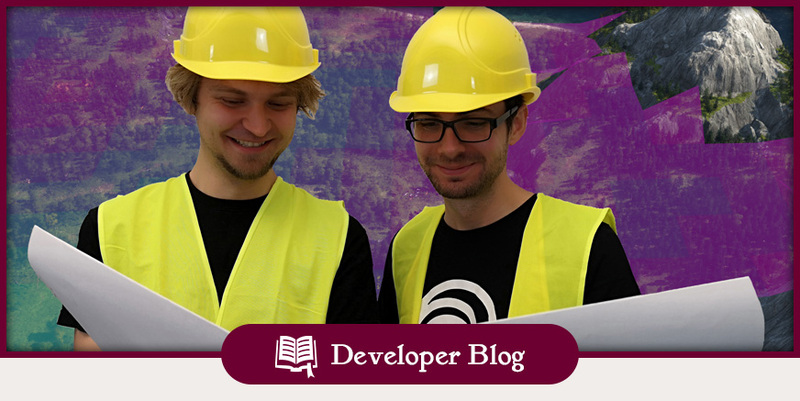 We are Jonas (the fella with the glasses) and Johannes (Mr. Smirk) and we work as Gameplay Programmers on Anno 1800. Together we are 53 years young and have worked for roughly 9 years at Ubisoft Blue Byte. What we did the 44 years before that, you ask? We played Anno, of course! But today, we’d like to give you some insights into a feature which has kept us both busy for many months now: the construction AI. For many Annoholics, sinking dozens of hours into trying to find the perfect city layout is a big part of the game’s draw. How can I make the best use of these last few remaining spaces, and is there any possible way I could fit my zoo in there? Another fundamental part of the Anno experience is playing alongside and against computer-controlled – or as we say AI (artificial intelligence) – opponents. However, creating a believable AI is quite the task, as the AI views things through very different eyes than human players; that’s why it falls to us to teach it how to construct functional and believable cities in a language the program can understand. 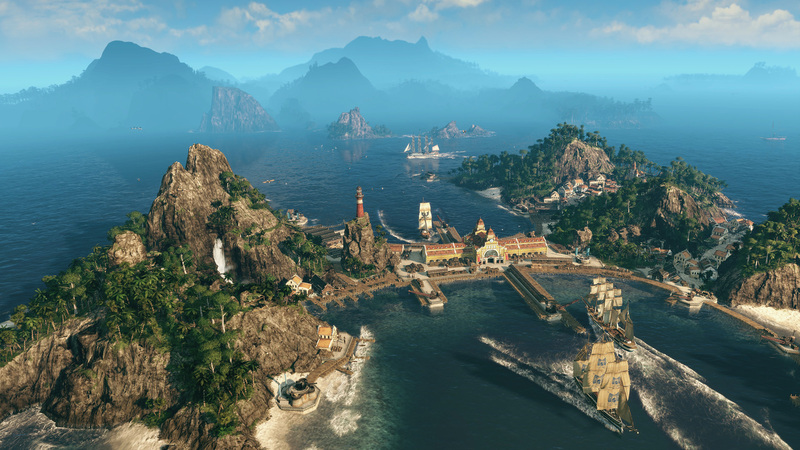 Anno 1800 will go back to the roots of older Anno titles such as 1404, where the second party AI (the characters settling and building on islands) follows largely the same rules as the player. Hidden under the hood of the so-called construction AI system are algorithms, which mimic the behavior of a player. Similarly to the player, your AI neighbor will need to generate money from taxes, produce resources to construct buildings and to fulfill the needs of the population to make them happy or to advance into the next tier. The number one rule when working on the AI system is that your friendly, aggressive or even quirky AI controlled players should behave like, and follow the same rules as, the player. Anno is a real beast when it comes to the sheer amount of features the game has to offer. Among them are some gameplay systems, which are too complex for the AI to use but still are important to compete with the player. To give you an example, it is not possible for AI characters to take on and finish quests and therefore, they cannot gain any items from this or similar systems. To avoid that the second party has to suffer a major handicap because of that restriction, we will provide ways to enable the AI to get other access to needed items. Quite the character – a personal touch for every opponent. By nature, programs like to calculate, compute and optimize things in split seconds, but transforming the AI into memorable characters like the envious robber baron von Malching is quite a task. We want that every second party character is memorable, from their diplomatic preferences to city layouts or what they focus on economically. All of these should be reflected in their construction behavior and result in a personal touch when observing their cities. Every character will follow a specific strategy, which defines things like whether they invest more money and resources into the culture or prefer a strong military fleet. Furthermore, this deeply layered system also differentiates between their preferred types of military ships, investment in defensive structures or what kind of cultural buildings they prefer. If a very rural looking island with plenty of golden fields of wheat fit a character, we will set parameters that the AI creates an overhead production in certain categories. In the case of the exploitative nature of von Malching, he will not show much love for vistas in his city and rather concentrate on mercilessly expanding his industry. The way they build street networks and plan residential areas is also taken into account, as each AI simply building the same artificially optimized layout would feel cold and unnatural. That customization goes as far as even allowing AI characters to prefer specific types of ornaments. This personal touch, behavior, and difficulty of a second party character depends on many different parameters which enable the AI to make decisions. These parameters define things like the general construction speed, which determines how many resource-producing buildings a character builds to generate construction materials or the previously mentioned fleet or defense construction. – Difficult second parties will make use of construction materials as soon as they become available. – Easier opponents will wait with their decision what to build, even if the material is available. – We can decide what types of ships an AI favors for trading or military fleets. – How fast will the AI expand? Will it try to capture a new island quickly or wait before the main island is well developed? While parameters are the general behavior rules, the AI also needs more specialized systems to be able to make a decision such as where is a good spot to place a building. While finding the right place to construct a production building might be trivial for us, an AI relies on various criteria to be able to make decisions, as it cannot rely on intuition as we do. – Try to avoid wasting construction space on the island, by not leaving small empty plots between production buildings or street layouts. – The windmill should be within the influence radius of a warehouse. – It should be close to other buildings of the same production chain. – As the windmill is a production building, it should be outside of the residential city center. The system will now check the whole grid and will assign scores based on these criteria. Location scores tell the AI where the best, acceptable or bad places are to place the building. There might also be scenarios where the island is so densely populated, that the AI has to rely on acceptable but not perfect areas. 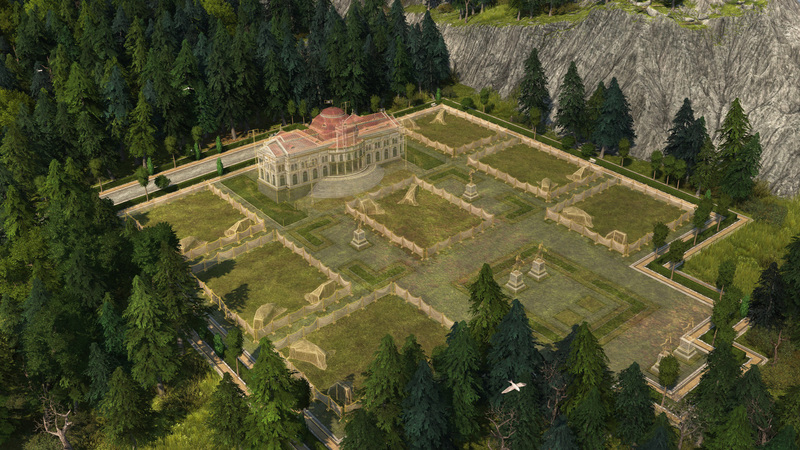 But there are additional factors to consider when deciding where to place a building- for example, what happens if the AI has several islands? Could it make more sense to outsource certain productions within the controlled archipelago, or perhaps even to a different session? Here you see the score system through the eyes of our AI. Such a complex system is neither done in a week nor can it be completed in the early stages of development. The programming team needs to tell our AI to react to constantly changing development builds and newly implemented features. When Game Design implements something new, the AI simply does not know how to deal with it, so we need to help it to adapt to the new situation. Imagine fire incidents were just implemented and the AI has no idea how to deal with the inferno as we need to tell it to construct fire stations beforehand. Without this criteria or knowledge so to speak, the AI would just have to watch its city turning into a cinder. There is another good recent example, which shows how a new feature can create seemingly unsolvable issues for the construction AI. We just implemented rivers into the game, which adds a completely new construction layer for bridges but blocks other constructions. As our AI has no clue what the new system is all about, it might try to place buildings into the river or completely ignore the landmass on the other side. Our job here is to teach the program why and when it needs a bridge, and where to place it. What sounds easy in theory is creating a new simulation including a lot of working hours and code work. In our job, we always chase after the latest feature implementations to keep the AI up to date and allow the AI to use all the available game features to compete against you, the player. When you think about the ton of intertwining features in Anno, creating a believable AI is an enormous task where every new content might interfere with something else. Construction AI is obviously only one aspect to create a lively and challenging second party, among many others such as military behavior or diplomacy. When setting the scope for our Anno 1800 construction AI, we had a lot of feedback from our community to work with. We hope that we are not only in a good way to deliver a believable but also fair and charming construction AI. We hope that we were able to give you some interesting insight into our work and looking forward to your feedback, as the construction AI is a joint effort between our experience and feedback from our fans.